Made by Kändler, Johann Joachim in Meissen, Germany, 1739. 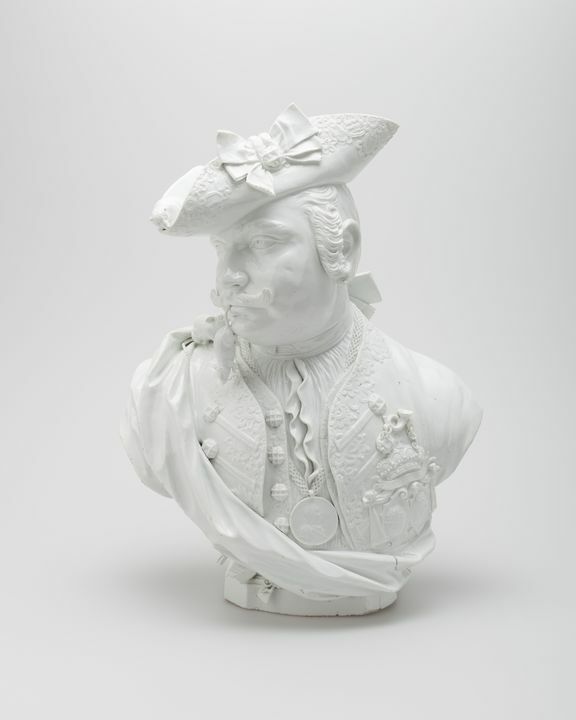 A head and shoulders satirical portrait bust in glazed white hard-paste porcelain. The piece is naturalistically modelled to portray a solidly built man with the head turned to his right, with an up curled moustache and wearing a wig with queue (pigtail) wound around with a ribbon. His elaboratecostume includes a tricorn (three-pointed hat) with a bow set on the left, an unbuttoned, embroidered collarless coat and waistcoat and undershirt. A large medallion with a profile portrait of Augustus III (coronation medallion), hangs from a cord that sits around his neck and chest. There is a badge on the left attached to his coat, with the Royal Polish and Saxon coats of arms. Above the badge there are two small chains with a post horn hanging from them. A cloak is draped across the man's body and there are small watch fobs attached just below its curve; one mouse dangles by its tail from his mouth, another is in the crown of the hat and the third sits on his right shoulder. The bust of Baron Schmiedel was modelled by Johann Joachim Kändler in Germany during 1739.